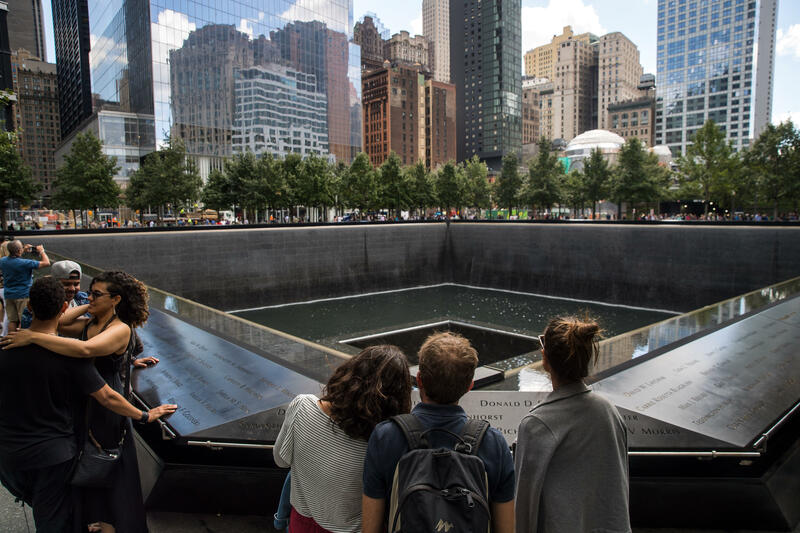 NEW YORK -- While the U.S. contends with the destruction caused by two ferocious hurricanes in three weeks, Americans also are marking the 16th anniversary of one of the nation's most scarring days. Monday's commemoration began with a moment of silence and tolling bells at 8:46 a.m., which is the time when a terrorist-piloted plane slammed into the World Trade Center's north tower. Thousands of 9/11 victims' relatives, survivors, rescuers and others gathered at ground zero to remember the deadliest terror attack on American soil. A somber ritual that included the tolling of bells and a reading of the victims' names was held at the Flight 93 National Memorial near Shanksville, Pennsylvania, honoring the 33 passengers and seven crew members who were killed in the terror attack. Vice President Mike Pence attended a ceremony outside the park's center at 9:45 a.m., the time that federal investigators determined passengers decided to revolt against their four al-Qaeda hijackers, who ended up crashing the plane in a field 60 miles southeast of Pittsburgh 16 years ago. Shortly before 10 a.m., a third bell tolled at ground zero to mark the moment a plane slammed into the Pentagon. The victims' relatives then resumed reading the names of those who were killed in the attack. "I can let it get very difficult but I discipline myself not to do that," former FDNY deputy chief Rich Alles told CBS New York. "I lost several extremely close friends of mine, many friends, many colleagues. I probably knew close to three-quarters of the firefighters that got killed that day." CBS New York reports three out of the five buildings in New York -- including One, Four and Seven World Trade -- are now open and occupied with residents and businesses alike. According to the Downtown Alliance, 61,000 people now live in the neighborhood, which is triple the number that resided there in 2000, helping to transform the site of America's worst horrors into a symbol of rebirth. Meanwhile, Republican President Donald Trump, a native New Yorker, observed the anniversary for the first time as the nation's leader. He observed a moment of silence and also participated in an observance at the Pentagon. The president and first lady Melania Trump joined with staffers on the South Lawn of the White House to mark the moment when the first plane struck the World Trade Center. The president and first lady bowed their heads as bells tolled. They then placed their hands over their hearts as Taps played. Trump was in New York during the 2001 attacks. He has offered unverified accounts of friends he lost that day and reports of Muslims celebrating when the World Trade Center towers collapsed. He will participate in a 9/11 observance at the Pentagon later Wednesday morning.